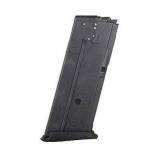 An extended 30-rd magazine for the Five-Seven pistol in 5.7x28mm. Features an injection molded housing and follower constructed of impact resistant, glass-filled nylon polymer for durability. The spring is precision wound from heat-treated Chrome-silicon wire for reliable feeding. The magazine has an o/a length of 7.25 , and includes a molded grip-sleeve to fill the space between the bottom of the grip-frame and the magazine base-plate. All components proudly made in the U.S.A.